Every October at CAMP TNUC we can’t make it to the 31st without bringing up Ghoulies. Weather it be around a crackling bonfire, sitting on the toilet or listening to W.A.S.P., we can’t shut up about these tiny bundles of death. This year we’re going to switch gears for a change and spotlight their household cousins, the Boglins. Boglins love to meet girls. Especially little sisters. Try one and see. 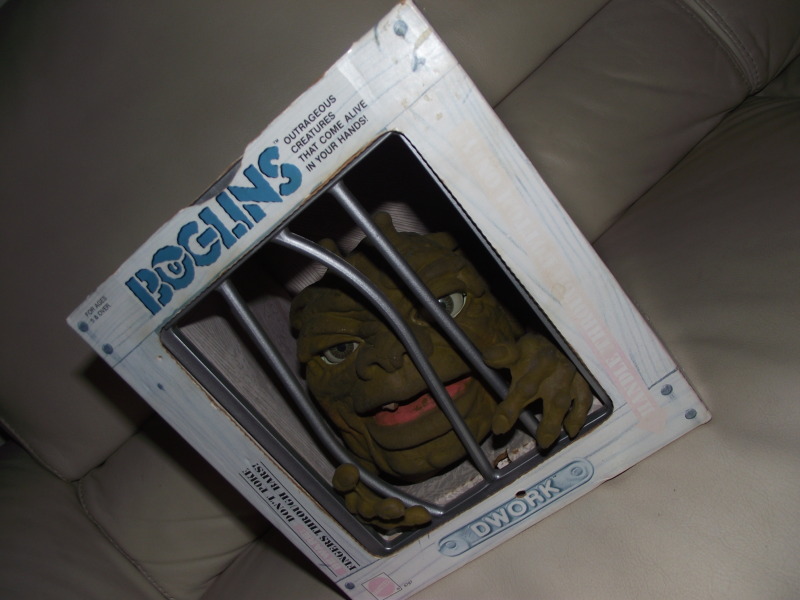 Boglins come alive in your hand. They’re squishy, squashy, squirmy and scary. And they come complete with their own cage! So look for Boglins. Then look for girls. Sounds like a passage from the TNUC bible. The first run were released by Mattel in 1987 and became very popular. The timing was perfect given that the world was currently at the brink of the “little dudes craze” during this time (Gremlins, Ghoulies, Critters, Hobgoblins, Munchies, Puppet Master, etc.). This initial family of Boglins were Vlobb, Drool and Dwork, who’s pictured below…ready to get gnarly on that off-white sofa. After the boom of the “big 3” Boglins and a family of “Small Boglin Subspecies” being released, Mattel really went bonkers and took Boglins to a whole new, weird level. The US and Europe were introduced to “Soggy Boglins”, “Hairy Boglins”and even a line of tiny plastic Boglins that came with a toilet and can of slime! 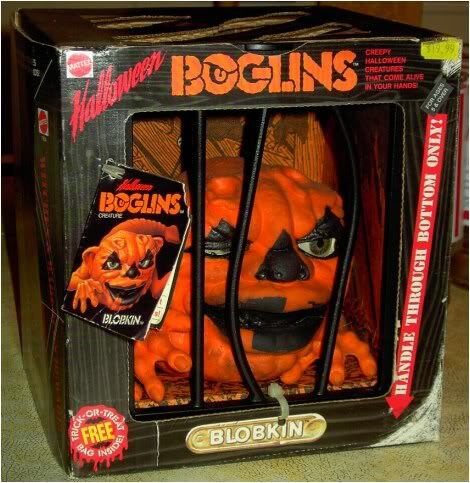 But these variations were all put to shame when the next Boglin would crawl in the room: the #1 Boglin all-star and the most sought-after of them all…”Blobkin” the HALLOWEEN BOGLIN. These bastards were part of the deluxe collection which features a second Halloween Boglin, “Bog O Bones”, who is equally as ruthless and difficult to track down. Ol’ Bog-O had a creepy, skeleton look going on that makes him a very stunning looking creature. Also included in their prison cell box was a trick-or-treat bag that I hear was big enough to consume a small child or two inside. 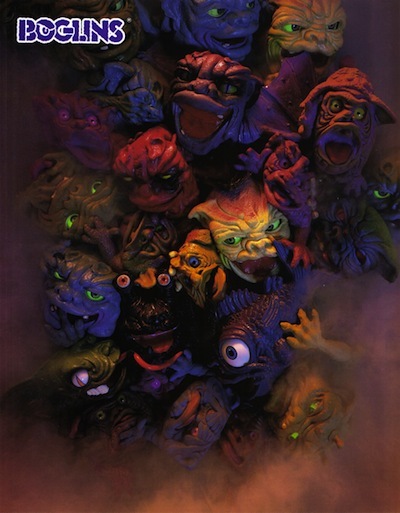 These overlooked classic puppets will always be dear to TNUC’s heart and if you’re an avid disciple of this blog and own a Boglin, maybe you could donate him to TNUC’s Boglin-dump?….a “donate-your-Boglin” charity case that will help enhance my Boglin Den. Hey…it was worth a try. I love these rude dudes. ← HOW TNUC SLEEPS EVERY NIGHT. Your sister must have had it so rough growing up. Check this out. A really interesting article on Charles Band's “obsession with little dudes”. Just thought you may want to check out my Tumblr site so you can stay updated on the new toy designs I am working on Tim Clarke one of the designers of Boglins and Sectaurs. Tim…wow, thanks for getting in touch with me. Your work is fantastic! 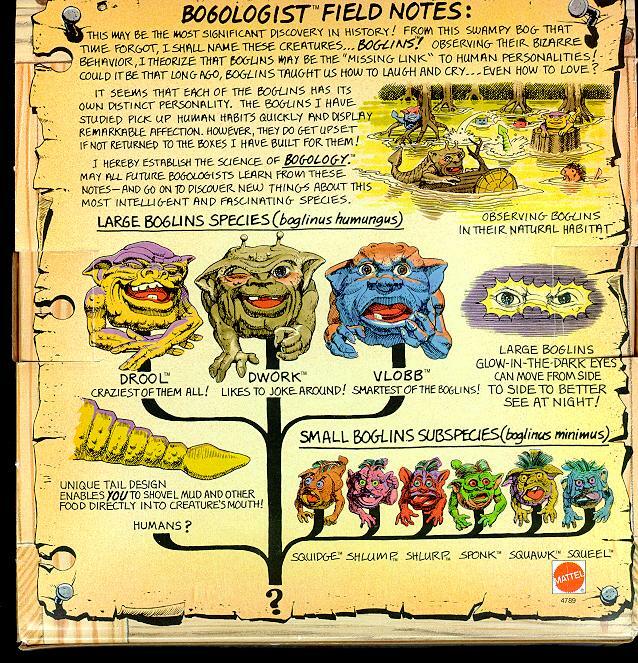 I'm beyond floored that an actual designer of the Boglins contacted TNUC. To me, the Boglins are the most unique and under-appreciated toy line to ever exist!